If you feel pangs of guilt every time you book an overseas flight for your holiday, then you will be heartened by the work of a Swiss aviator and inventor. Bertrand Piccard has been working for years on the creation of a solar powered aeroplane and has now proved that it can store enough energy to fly for hours in darkness. The long-awaited night flight of the Solar Impulse in July 2010 went entirely to plan and the lightweight plane was airborne through the night for several hours. Piccard says the success of the flight was confirmation that it could be possible to use the power of the sun to fly our planes in years to come – and he’s already working on a larger model which will have space for two pilots. 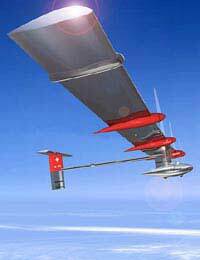 A solar plane had flown for a short time in darkness previously but that was an unmanned machine whereas this one had pilot and project CEO, Andre Borschberg aboard. His historic flight – a total of 26 hours – broke the world record for the longest and highest solar flight in history. Solar Impulse took off in early morning and flew almost to the limit of its maximum altitude (just over 28,000 feet) so that the sun could charge the 12,000 solar cells on its vast wings – providing power which could be stored in batteries. By the time sunlight faded, the plane had stored enough energy to remain airborne throughout the night - and when the sun rose again, the team decided to lengthen its flight to allow the batteries to recharge. According to the team, this proved their theory that the plane should be able to stay in the air indefinitely – charging its batteries in sunlight and then using that stored energy to fly in the dark. The 26-hour flight posed a few problems from a purely physical point of view. How would the pilot stay awake and alert for the whole time – and what about the call of nature? The first problem was solved by special sensors in an insulated pilot suit. Monitored by the team on the ground, this could rouse Borschberg if his consciousness level dipped or if the team noticed that either wing was tilting too far. It was vital that the plane's wings did not tilt by more than 5 degrees – otherwise it could spin out of control. The other problem was solved by a small portable urinal. Aviator Piccard is no stranger to publicity – in 1999 he made history when he completed the first non-stop balloon flight around the world. He hopes the Solar Impulse flight will inspire people to consider renewable energy for many more uses and is now designing a new plane which he hopes will fly the Atlantic from New York to Paris in 2012. The ultimate goal is a complete round-the-world flight set for 2013. The flight that will not use a drop of traditional fuel or cause any of the pollution associated with traditional planes.